In the early morning of October 22nd 2016, Water Protectors left the encampment to walk to DAPL work site #127, off highway 1806. We walked to the work site where our comrades locked themselves down to equipment to prevent any more work being done on the Black Snake. They took action because the Black Snake must not be built, the risk is too high and a devastating spill is an inevitability, we went because we too recognize our duty to take action. We went because we have had enough of Energy Transfer Partners and this pipeline, and so have all of us here at Oceti Sakowin, we have had enough of the heavy handed terrorism so casually deployed by Kyle Kerchmeier of the Morton County Sheriffs, DAPL Private Security G4S, and the National Guard. Over 140+ Water Protectors were chased down by riot police, pepper sprayed, beaten with batons, and kettled in. 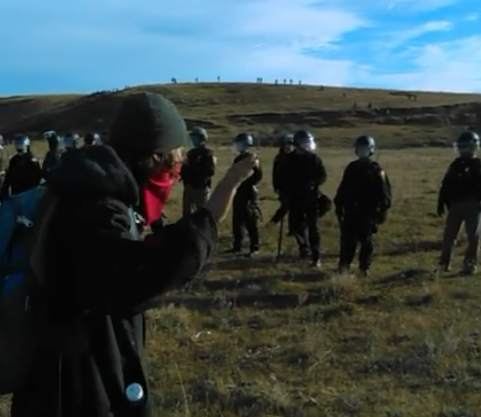 The police made the mass arrests at this site, the charges were Criminal Trespass, and Engaging in a riot. The First wave of innocent Protectors were in court today and all pled not guilty, they are awaiting trial at this time. DAPL is in direct violation UNDRIP on Sacred Sites and as well as in violation of all Indigenous Laws anywhere worldwide. To desecrate the bodies of our Ancestors is an abomination, yet somehow the illegal and corrupt Government and corporations give themselves permission to take these actions in the name of genocide and land theft. They work together and promote a capitalist lifestyle that is in direct opposition to natural law, they are rooted in profits and have no sense of the destruction to not only land and water but also to Indigenous Peoples lives they leave in their wake. They have no jurisdiction or permission from the Standing Rock Sioux Tribe to build this pipeline, and it is not only our right and our duty to protect the Ancestors it is our responsibility to the future generations to take action to uphold the People’s right to say NO. 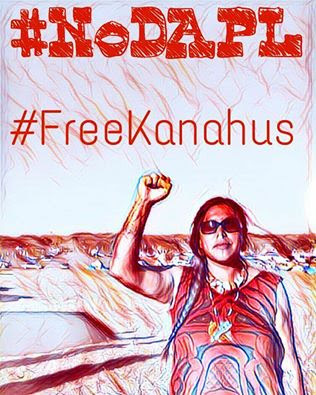 The future of the planet depends on what Indigenous Land Defenders and Water Protectors do NOW, we cannot afford to sell the future of the entire planet for momentary and monetary greed. They are unleashing a violent fascist police state on the people in a bid to make the most money the fastest, leaving our lands and water poisoned. We recognize that we the People acting in Unity and Prayer will stop this pipeline, and we are acting accordingly. Message from water protector: "Sitting at the hospital in Fort Yates because today at the action the police maced, and hit innocent people with their batons. Our fellow youth council members were hit with a baton multiple times because they tried to protect the children. One of us got arrested and another is in the hospital. This is what they are doing to us. Police brutality at its finest people. We are unarmed. We are peaceful & prayerful. Come stand with standing rock. Pray for us please!" 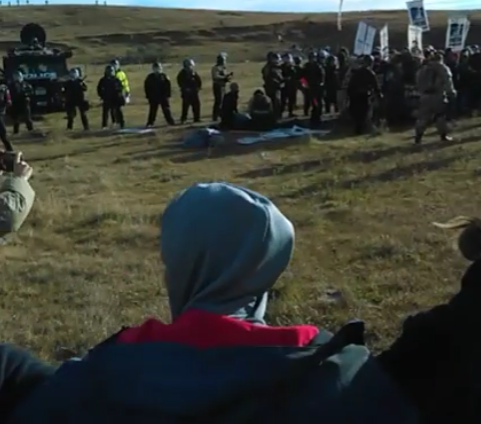 Water protectors were pepper sprayed and thrown to the ground by police. About 200 water protectors carried out a prayer walk on Saturday morning, where one lock down was underway at sunrise. The arrests include Lorenzo, Unicorn Riot live streamer. This makes the fifth Unicorn Riot live streamer arrested. The location is three miles west of 1806. Hwy 1806 closed in both directions Saturday morning. "We need cars from camp, we have elders." "They have us surrounded. This is not even Dakota Access property." "There are little children here." I have called the jail for details and when she will appear for bail. They told me to call back tonight, I will report she was less than helpful and you could hear a lot of loud background noise when I reached the jail by phone. It has also been reported that Sasheen & Crow have also been arrested, however I cannot confirm that as of yet. I will try when I call back tonight. 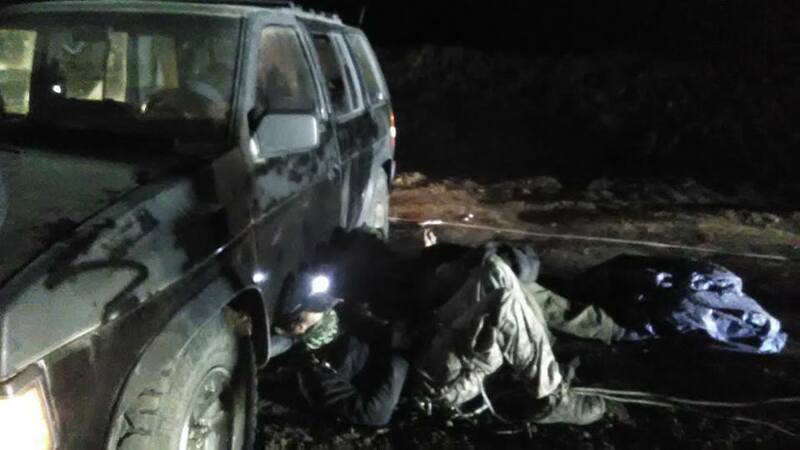 Morton County, ND – Early on Saturday, October 22nd, water protectors from the camps near the Standing Rock Sioux Reservation set out on foot to confront construction that threatens to destroy more sacred burial sites. Dakota Access has continued with construction despite the September 9 request from the federal government to suspend construction within 20 miles east and west of Lake Oahe. On Saturday morning dozens of riot police were guarding the construction site, which is about five miles away from the encampments. Unicorn Riot was on the ground providing live streaming coverage today. Give us phone numbers to call!!!! Thanks. Phone numbers added to post of Morton Co. Sheriff. I'm trying to share this page on twitter... and it's not letting me share this particular link, I've never had this happen before. It says it thinks it's "automated" (spam) and doesn't let me tweet. Dammit. I'm sharing it all the other ways I can. Its is a shame that these police are fighting against people who are protecting water for not only them but for the family of these very police. Are the wages from the wealthy oil industry worth more than the future of your children? Twitter has blocked our links for weeks. Twitter will not say why. Maybe twitter needs to grow a back bone or be boycotted. Every video I have seen the police are in the wrong and if I were police elsewhere where I would be upset. These police are giving other police bad names. This is really upsetting. I can't believe this is happening in America in 2016. What is wrong with this country? They're hurting innocent people for what? For no reason at all other than they happen to exist and they happen to protest the destruction of their way of life, their water. The cops and government are committing crimes against humanity. When will Americans wake the hell up and do something to stop this travesty?? ....the shape of things to come.....??????????? ....It is not only " their way of life" or "their water".......!! WE,the "indigenous" people , should NOT have to protest against the destruction of ALL the NECESSITIES that are CRUCIAL to the survival of Mother Earth...!!!!! !.....How long will these protests remain " peaceful", when faced with brutality and unjust actions, committed by those whose children we are trying to save...??? Week after week, month after month we have watched over this country as protests happened, many of them turning violent, some deadly. We watched cities burn to the ground. Here we have a small group of peaceful people praying, no weapons, no violence, no destruction of any property, and this is how they are treated. 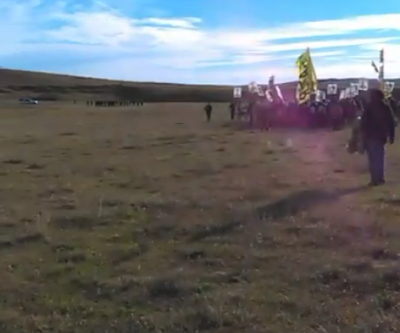 Last year we watched a group of armed people take over a wildlife refuge in Oregon. They were allowed to come & go every day as they saw fit, they were allowed to keep the water and other utilities. They were allowed to destroy government property and Native American artifacts and sacred grounds, and every day they were told they could leave without consequences. 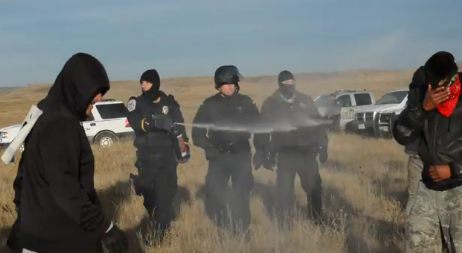 Now we look to North Dakota again and we see this... pepper spray/mace, batons, loaded guns, helicopters, armored vehicles. This is entirely backwards. If I could be in North Dakota right now I would be there. My spirit is there, with all of our people protecting Mother Earth. Stand strong my brothers & sisters, my cousins, our elders and our children. The rest of us are doing whatever we can to help from where we are. Sharing links and videos, speaking out, making calls, seeking donations, whatever we can do to help you. We are here but we are always with you. Awhile ago I saw a list of things that could be donated to help you at the camp. Can you please post that here with the address. I feel compelled to help and that is at least something that I can do. A Prayer Walk. While in Prayer. Peaceful Protest. Who lead who towards the Police or who might have directed police to attack, strike, brutalize, criminalize, detain and eventually mark for life. Isn't Obama involved here somewhere and why is this treatment still going on or do well have to have someone from another country to inform him of what's happening again. Need some international pressure for sure but some camera's for sure so when the dust settles and it will settle that the "State" will have to pay major civil rights settlements if eyes are watching. Really in Prayer. Ok this is going to far for civil reality. Sounds like a set up for me. Give everyone stink bombs to lay on the ground so the cops can step on them. Very disturbing fact the U.S.government does not care at all about you, in any good for Us kind of way. time for a change of this extremely corrupt free ride for the political criminal complex, to a upstanding way we all can be proud of. I come from L.A.California, with Mexican-american blood and coming home to do what i can to help. Lets all do something for the better!